ICANN58 EURALO-NCUC Outreach Event - What can you change at ICANN? 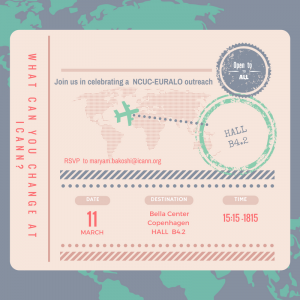 Noncommercial Users Constituency (NCUC) and European Regional At-Large Organization (EURALO) invite you to participate in an outreach session for civil society, academia and end users. Time: during the 58th public meeting of The Internet Corporation for Assigned Names and Numbers (ICANN) on 11th of March 2017, at 15:00 –18:00. Join our interactive discussion with ICANN veterans and new community members – we are going to convince you why ICANN is different this year and why you should care and join or at least keep up to date with what is going on! We are NGOs and civil society organisations, Internet users and academics who believe that everyone has a stake in Internet governance, and everyone can participate and contribute to Internet policy. We ensure that civil society and end users have a strong voice in ICANN and contribute to policy processes. NCUC and EURALO deal with many critical issues related to domain name system at ICANN, such as human rights, data protection, jurisdiction, access to domain names, transparency, diversity, and many more. We will introduce NCUC and EURALO, explain what has happened at ICANN last year during and after the transition from US oversight, and open the floor for discussion on various topics, where civil society, academia and users are contributing to policy making. You can bring up any issue of your interest and get the answer on how we are addressing it at ICANN. Privacy? Accountability? Jurisdiction? Cybersecurity? Anything else? NCUC and EURALO members are working on these issues and would be happy to discuss them with you! The Outreach will be followed by an informal reception, where you can meet like-minded people and continue the discussion. We look forward to seeing you on 11 March at the Bella Centre Copenhagen. 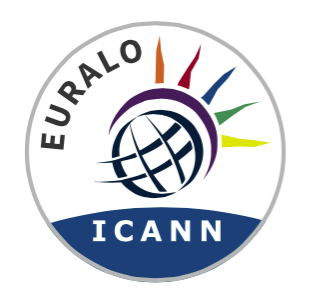 European Regional At-Large Organization (EURALO) represents the interests of European Internet end-users in ICANN. EURALO is one of five regional organisations that are primary organizational home for the voice and concerns of individual Internet users in ICANN. EURALO advises the ICANN Board on the activities of ICANN that impact on user interests, and advocates for the Interests of users in ICANN policy and in other Internet governance processes. Noncommercial Users Constituency (NCUC) advocates positions on domain name-related policies that protect and support noncommercial communication and activity on the Internet. NCUC members are involved in civil liberties and human rights, Internet freedom, consumer protection, education, research, development, and many other areas of public policy advocacy, both within ICANN and contributing to other Internet governance and Internet policy spaces. NCUC is a leading representative of civil society in ICANN’s multistakeholder model.